Delhi is an amalgamation of many cities which were build and destroyed over many centuries as It has been ruled by many different dynasties starting from Tomar dynasty (~ 700 CE) to British rule. So, it’s not a surprise that Delhi is gifted with a very rich built heritage. 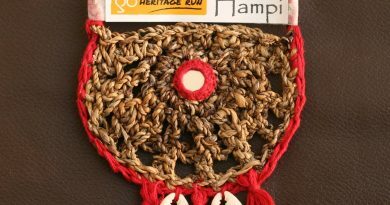 It has around 1200 buildings with varied degrees of heritage value right from Mauryan period to the end of British rule and it has 3 UNESCO world heritage sites. Most of the heritage sites of Delhi especially those build during the Sultanate period now lies in a region called as South Delhi. I also happen to live in South Delhi and my running route inevitably contains many historical sites. 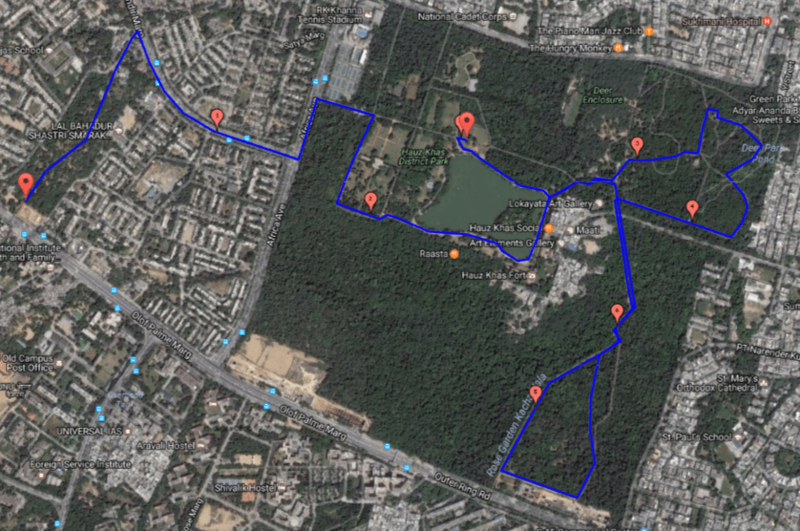 My go to place for running is a cluster of parks around Hauz Khas Village (HKV). It’s around 1.5 km from my place so typically I start running from RK Puram Sector-3 which is just across the road from my place. The point where I start is near a small madrassa complex which was built on the ruins of a medieval mosque whose now only western wall is visible. From here the route is – Run through Sector-3 park which contains small part of Delhi ridge (Aravalli rocks) and at the end of this track near Venkateshwar Marg, there is a huge tomb known as Bijri Khans tomb built around 15th century; there is also a small unknown Tughlaq period tomb attach to it. From Bijri khans tomb turn right and run towards Africa Avenue road and at the intersection turn left and run for around 600 m to reach Hauz Khas District park. Attached to Hauz Khas District Park there are two more parks/urban forests attached to it. There is Deer park forest towards Safdarjung Enclave and Rose garden forest facing IIT Delhi. Hauz Khas is a compound word made up of two Persian words where Hauz means water tank and Khas means royal. 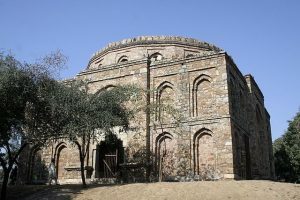 It was a royal water tank built in Alauddin Khilji reign (early 1300s) to fulfill water needs of people living in Siri fort area. The tank was expanded and de-silted by Feroz Shah Tughlaq in 14th century. Route map link – here. Inside Hauz Khas District Park one can either run in anti-clockwise or clockwise direction. In the eastern periphery, there is a huge sultanate complex where there is cluster of monuments. The main building in the complex is a Madrassa which was at its prime was one of leading center of learning in Asia. The Madrassa complex was built by Feroz Shah Tughlaq and in those times people from faraway places used to come and study here. The beauty of the complex was such that Tamerlane who caused great devastation in Delhi couldn’t resist but praise it and Feroz Shah Tughlaq also chose it as his resting place just for its sheer beauty. 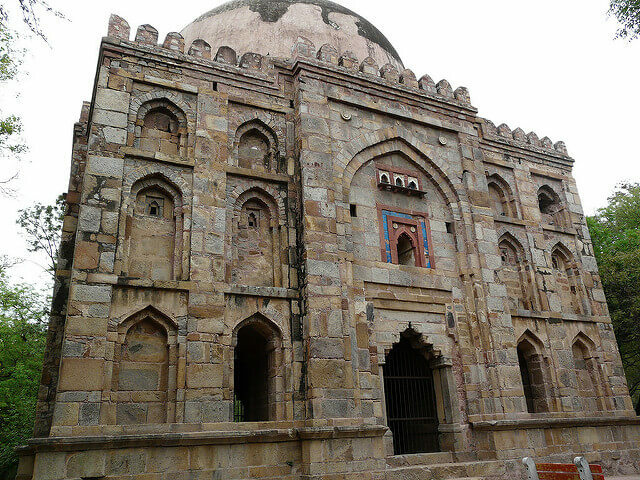 There is also a mosque overlooking the Hauz Khas lake in the complex. From the northern edge of this complex take right and go towards Deer park forest, there again the options are to run in either clockwise or anti-clockwise direction and inside the circular periphery one can see Bagh-i-alam ka gumbad (dome), a fine Lodhi tomb, and nearby it there is Tohfeewala gumbad and another dome locally known as Kali Gumti. 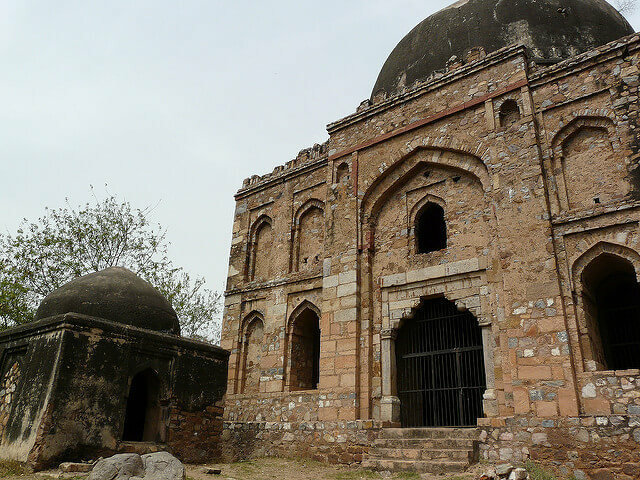 Both are Tughlaq era Tombs. Once Deer park loop is completed, run towards Rose Garden crossing the road that leads to upmarket Hauz Khas village market. The Rose garden loop is around 1.5 km. Don’t get fooled by the name Rose garden as it is a semi wilderness area where only a small section has some rose bushes. After running this loop, head back to HK district park and while running back inside the district park there is another small monument towards the north-western corner of the lake named as Munda Gumbad (headless dome). It is situated upon a small hillock and from the top one can see a nice panoramic view of the Hauz Khas Complex. It is a perfect place to finish off one running. 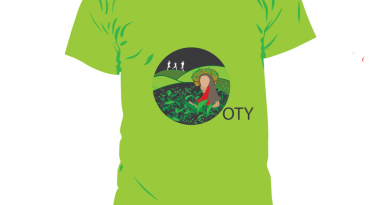 Running through this route one can see monuments from Khilji Dynasty, Tughlaq dynasty and Lodhi Dynasty and at the same time enjoy one of the greenest parts of Delhi. Thanks Juan. 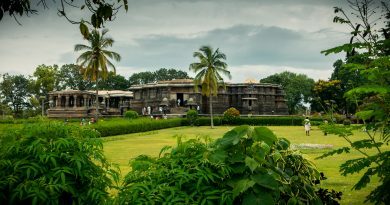 It’s a perfect combination of greenery and heritage .